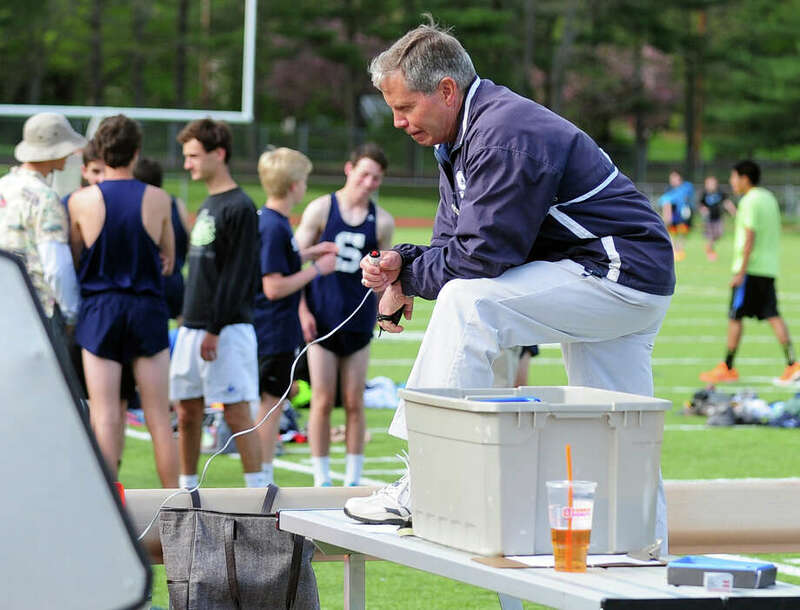 Staples' Track Coach Laddie Lawrence, during boys track action against Westhill and Trumbull in Trumbull, Conn. on Tuesday May 13, 2014. Longtime Staples High School track coach Laddie Lawrence will be inducted into the National High School Coaches Association National Hall of Fame. This year's induction ceremony for the Class of 2015 will take place at the NHSACA national convention at the Kahler Grand Hotel in Rochester, Minnesota on June 19, 2015. This year's class includes 30 coaches from `6 states across the nation. Coach Lawrence was selected for this national honor by his state's high school coaches' association, according to a press release. This selection was based on longevity, service to high school athletics, honors and other specific state criteria. The National High School Athletic Coaches Association is the oldest coaches association in the nation formed by coaches, for coaches, and has honored coaches from across the nation with induction into the NHSACA National Hall of Fame since 1996. Coach Lawrence will now be added to this illustrious list of coaches in honor of his outstanding career. He has coached at Staples High for more than four decades and has accumulated close to 30 FCIAC titles in his coaching career.